Today started off bright and sunny in Flores, and we were well-rested and happy to be on the bikes. 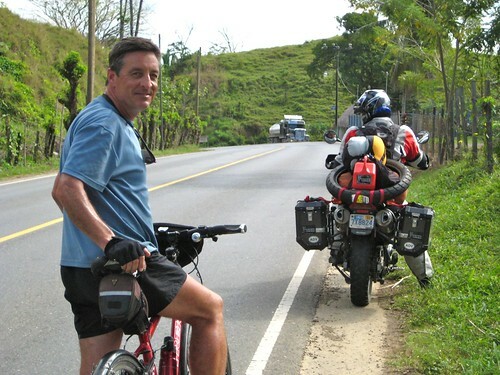 The plan was to ride down CA-13 until it intersected with CA-9, and then cut across on a little red road on the map from Gualan to where it intersected with CA-11 not terribly far from El Florido, the border crossing into Honduras. We figured we’d get halfway today, find a place to stay and then ride the rest of the way and cross into Honduras tomorrow. The riding was easy but beautiful. 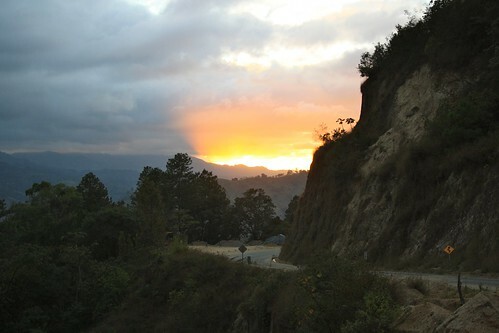 The parts of Guatemala that we’ve seen are just beautiful landscape. Mexico was varied and lovely, presenting you with a wide range of landscapes… but the roads in Guatemala so far have been much less challenging, but the landscape lush, verdant and green. 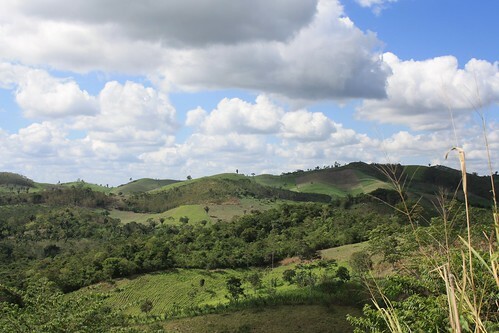 We saw more of the rolling hills that Kay mentioned riding in a couple of days ago, and we also saw a beautiful lowlands valley; watched rain falling on a mountain range off in a distance and just had an absolutely beautiful day of riding. At one point, we ran across a man on a bicycle towing a small bicycle trailer. He was obviously traveling long-distance, and Kay waved and asked through the headsets “Do you want to stop and talk to him?” “Sure!” We pulled onto the shoulder (but still practically in the road) a few feet ahead of him and he rode up beside Kay and started chatting. It turns out, his name is Jeff and he’s a bicyclist from Montreal. He’s ridden over five thousand kilometers (miles?) in Europe, including the Alps, and is currently riding from Cancun to Costa Rica and then back to Cancun, or possibly elsewhere in Mexico. He was a really cool guy and we had a nice chat with him. While we were chatting with Jeff, a very nice, but compact, RV pulled up behind us. Out stepped a friendly Frenchman, and Jeff (who had pulled up and was chatting with me at this point) explained that he’d met this couple at a campground. Francoise introduced himself, and gave Kay a post-card for himself and his wife Dominique. They’re on a two-year trip, but I think Jeff said they were revising it to a one-year trip. Francoise came up and started chatting with Jeff, and Jeff translated for us – telling Francoise that we were headed to Patagonia. It was a lovely chance meeting, and Kay and I were very amused that while we were chatting with one traveller, another one came along. We’ve met some really great people on this trip so far, and these are the encounters I want to remember. Lunch was great. We stopped at a random commodore in Chacalte, and generally had a good, easy day. The scale on the map we have is a bit misleading, and we made it much farther than we’d anticipated. By around 4:20PM, we’d made it to Gualan, and the road forward seemed just fine, so we thought we might actually make it to the border before it closed, find a hotel in Copan and be ready to see the ruins in the morning. What we failed to consider was that there was a minor mountain range between here and there. Even then, we made good progress; in about 40 minutes, we had crossed 2/3 of the stretch between Gualan and where it crossed CA-11 toward El Florido. The sun was setting, but we thought another 20 minutes should see us to the major road, so we’d just head that way and try to grab a hotel. La Union thwarted us, though. At first glance, this is a cute little mountain town. It was by far the biggest town on the route between here and there, and we were heartened to see it. The road through the town wasn’t obvious, so we just started going where most of the traffic seemed to be going; typically a good strategy for getting through the town. We quickly discovered that this town was a bit more challenging than pretty much every road we’ve encountered in Guatemala; steep, paved grades covered in a layer of dirt that makes it impossible to stop our heavy bikes. I was quickly stressed out trying to maneuver the bike here. We made it halfway through town and were apparently looking out of place, so another moto stopped to ask where we were going. Kay conveyed that we were looking for the frontier to Honduras, and one of the moto riders mimed going back the way we had come. Apparently he could tell that we weren’t sure about the route, so he actually turned around and led us through town. Back to the road we’d come in on. He indicated that we needed to go down this road, and take a left at some point, and then go around. We started heading that way, and it was dusk… just minutes to full dark. The problem was, neither of us could remember a left turn for a long time. In fact, it seemed to us that the only route that was remotely close to what the kid was trying to indicate was to go all the way back to the major road we’d left (CA-9), take it over to CA-10 a bit further down, and connect with CA-11 that way. Thus ensued some debate about what to do. The map showed a road going through, but the guy on the moto seemed to think we needed to go back the way we came. Neither of us was keen on backtracking through this road after dark, as it was full of potholes and slippery dirt sections. Kay posited that the map had a road going through the dot at La Union, and it seemed better to try that way again and make some forward progress for tomorrow. I bailed completely on this decision as the town had stressed me out due to the challenging riding, and I wouldn’t voluntarily say “let’s go back there” unless Kay thought it was the right thing to do. Either road seemed equally perilous at this point and as we stopped to double check the map Kay’s low beam died. The high beams work, but the regular setting is so dim as to be practically non-existent. So when Kay said that the lesser of two evils seemed to be trying the town again, I was ready to go along with that. So, now Kay has high beams, and the Denali lights, which are even brighter. We made it through the town fairly quickly this time, and Kay stopped at a gas station on what we thought was the way out of town to ask if we were headed toward the next town on the map. The gent at the gas station didn’t seem to understand, which we chalked up to our horrible accents. So Kay tried to point to the map, but it was a bit dark to read. The man went into the gas station and brought out a flashlight. A quick glance at the map and he realized he’d need someone who could read, so he called out his wife who started pondering the map and asking Kay about where we were going. Unfortunately, the next town on the map (Lelá Obraje) simply doesn’t exist. Or possibly doesn’t exist anywhere on the road near here. That much she was certain of. The border town, El Floride, she was familiar with, but uncertain as to how to get to. She was confident in how to get us to the nearby town of Chagüitón though. Sadly, that appears to be along a dead-end road that wouldn’t actually get us anywhere. Routa 11 she didn’t know how to get to. And Kay didn’t realize that Copan was not just the name of the town, but the name of the Honduran state just over the border. So, us saying we were headed for Copan wasn’t particularly useful. More debate ensued and with it now being full dark we all came to the agreement that it was Mucho Peligrosa and that we ought to get a hotel in town, and the lovely woman offered to drive over there and show us how to find it. So she got in her pick-up truck and started driving back through the town center toward the hotel. As Murphy would have it, we got to a bit of road where a truck was trying to come down a steep hill and turn left, and she was trying to turn right up the hill – and there wasn’t room for both of us. The truck clearly wasn’t going to move for her, and the drivers started yelling to her to pull forward and let them by. Eventually she pulled forward into another road, and I thought we were just trying an alternate route, and followed her. But she just pulled far enough forward to get herself out of the road and then stop. I tried to follow and got as close to her as I could so the truck could get by, and then there was a long line of traffic following. Eventually the traffic got through, and I started to back my bike up and around so she could back out into the intersection and go the way we were trying to go. That’s where things started to go south. The pavement was covered with a layer of dirt and the bike was just too heavy on the incline – I lost it. Me and the bike went down for the first time on this trip; the bike on the left pannier, and me flying off down the hill on my left shoulder and hip. I popped up quickly and waited for Kay to come help me right the bike, which was in the middle of the road, but the incline was too steep for Kay to safely park his bike so I had to go help him lever his bike upright and pull it forward to a place where he could park, so he could get off his bike and come help me. In the meantime, the nice little lady from the pick-up truck had hopped out, was asking if I was ok and was ready to try to help us lift the bike. I tried to convey that we didn’t need help, but she was insistent about helping us get the bike up. We did right it, and I asked Kay to move it to a place that would be safer for me to mount it, so we held it steady while Kay got on and pulled it forward in front of his bike. It was one of those squirrely up-hill wiggles which went fine until he tried to park it at which point it went over on the left pannier *again*. We righted it again, and I mounted up and started following the woman – successfully. We got to the hotel (on a relatively flat road, thank god) and Kay and the woman went in to book us a room. The woman helped to convey to the hotel proprietor that we needed a place to park our bikes – “No, no, big motos!” she had to convey, because I think they were just suggesting we stick them somewhere in a lobby or hallway thinking they were small bikes, so a guy came out and offered to lead us to a secure place where we could park the bikes. We turned around and followed him back up the relatively flat road… and onto another steep incline of doom. This one had a mud wallow at the bottom that I got stuck in at first, but I was determined not to drop the bike again so I took it slow and easy and after a couple of tries, I got up the mud wallow and started up the street. Sometime during this point, Kay tried to stop his bike on the incline and the incline was so steep and the bikes so heavy that the brakes simply wouldn’t hold – the bike started sliding down the hill in the dirt and went over on its side. I managed to stop on a slightly less steep section of the incline and hold my bike in place using both brakes, but there was no way I could go help Kay get his bike up without laying mine down, because it was just too steep for me to get off the bike. Luckily, the guy who was leading us to the parking ran back to help Kay, and after some failure to communicate, they got the bike upright and the guy ran ahead to the parking. He opened the gate, and I tried stopping so Kay could turn in and then I could go in, but I had the same problem – the bike was simply too heavy and started sliding backwards in the dirt, and went down on the right this time. Luckily it went down against a wall so it didn’t go down all the way, and it was relatively easy to get it upright again and have Kay mount it and ride it into the parking area. The problem, of course, was that we had been following a man walking up a hill. The bikes simply couldn’t surmount the hill at that low of a speed. Given a little oomph towards the end when we knew where we were going and they roared up it happily. With both bikes safely parked, only 4 drops later. I dropped my bike twice, Kay dropped my bike once and he dropped his bike once. All because the bikes are so heavy and simply don’t have traction trying to stop on steep inclines in the dirt, or dirt covered concrete. Gravity and heavy bikes are not our friend. I insisted on bringing both panniers all the way back to the hotel, even though it was down the steep hill and a bit of a ways down the relatively flat road, because I’d seen that my left pannier was borked. Kay had carried his heavy panniers a long way to parking once already and was smart enough to just grab a few essentials from his panniers and leave the rest on his bike in the parking lot. Final tally of damage for today: my right wrist is sore for some reason, even though I fell on the left, in a similar place to where I broke something in my wrist on our excursion in August. Dunno if I aggravated the injury lifting the bikes or what. My left pannier is partially destroyed; the plastic corner on the front left side of the pannier has bent forward and out, and the SW-Motech TraX cases don’t have metal inside the plastic cover. So now there are things poking out the plastic from inside of my pannier. It didn’t crumple like a piece of paper, and the stuff inside the pannier is fine, but the pannier itself is definitely no-longer watertight and is going to need a metal worker at some point to address the corner. For now, we’re hoping duct tape is going to hold it. Tomorrow’s plan? Go back to the main road 32 KM away and take the long way around on “big” roads. We’ve had several independent sources confirm that “You can’t get there from here” and I’ve had enough adventure in this town to admit defeat and try a bigger road.